As you walk through the Holy City, you will inevitably stumble upon private family cemeteries and church graveyards, some tucked away and others right along the sidewalk. Buried here are noteworthy people such John C. Calhoun, a U.S. Senator and Vice President; Edward Rutledge, a signer of the Declaration of Independence; Charles Pinckney, a signer of the U.S. Constitution; and Confederate soldiers. Keep scrolling to map out your own graveyard tour (all within walking distance to The Charleston Chestnut Mansion) or schedule a Charleston ghost tour with Ghost City Tours or Bulldog Tours. Tombstones aren’t just an indication of who was laid to rest in that plot; they help historians understand the demographic and social history of the city since it was founded in 1670. However, in the beginning, Charleston lacked a supply of stone to mark the graves, so wooden stele markers were used until the 1820s, when custom stones were shipped in from New England. As a consequence of the wooden material, the grave markings sometimes disappeared — or were never marked at all — meaning there are hundreds of burials in church grounds that cannot be seen (at least not by the living). Then in 1836, burials in the city were prohibited due to health concerns on the low-lying land. 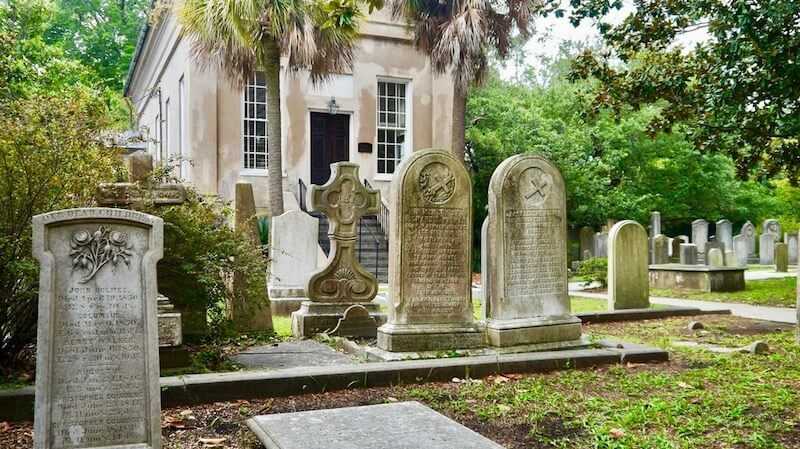 As one of the oldest graveyards in Charleston, there are more than 500 gravestones which remain visible on the grounds with more than 730 individual names inscribed. Additionally, church records show another 620 names who are also likely to be buried there (just missing a marker). Known as one of the most haunted places in Charleston, many say they have seen Revolutionary War soldiers wandering the grounds. The church was first built in 1772 and then rebuilt in 1854 after it was destroyed during the Revolutionary War. While most of the city’s burial sites undergo continuous upkeep, this graveyard’s overgrown brush and unkempt appearance is intentional, as the Unitarians believe in using the overgrown vegetation as a symbol of life after death. 1. A 14-year-old girl named Annabel Lee fell in love with an 18-year-old man stationed at Fort Moultrie in the 1800s. Her father didn’t approve and did everything in his power to keep the two apart. Still, the two would carry on their forbidden romance via secret meet-ups. However, their love did not endure, as the soldier was eventually transferred. After his departure, Annabel died and was laid to rest at an unmarked grave (so she couldn’t be found). Two days after Edgar Allan Poe died, “Annabel Lee” was published. Coincidence?!?! It’s said that Annabel’s ghost can be seen wandering the paths, looking for her long-lost lover. 2. Mary Bloomfield, who died in Mount Pleasant in 1907, is alleged to haunt the graveyard. Bloomfield was happily married (or so she thought) for when her beloved husband departed for a business trip to Boston, he never returned. She was so heartbroken, it is said her ghost has been seen wandering the paths looking for him. 3. Accused serial killer Lavinia Fisher haunts the Unitarian Church graveyard, which is where she was thought to have been buried. However, Fisher was actually buried in a potter’s field (now located under MUSC) after her execution. Established in 1680, St. Philip’s is the oldest religious congregation in Charleston. Prominent Charlestonians laid to rest here include several colonial Governors, five Episcopal bishops, John C. Calhoun, Edward Rutledge, Charles Pinckney, Christopher Gadsden, Dubose Heyward, Maria Gracia Turnbull, and Col. William Rhett. In 1888, Gaston and Sue Howard, parishioners of the church, were expecting a baby. On June 10, the baby was stillborn. Sue died six days later. 99 years later, on June 10, 1987, local photographer Harry Reynolds was taking photos around the city. Upon having the film developed, he noticed that in one photo there appears to be the ghost of a woman kneeling by the aforementioned infant’s grave. That woman is suspected to be Sue Howard. St. Michael’s is the oldest church edifice in the city, dating back to the 1750s. John Rutledge, an Associate Justice of the Supreme Court of the United States and also its second Chief Justice and the first Governor of South Carolina after the Declaration of Independence, is laid to rest here. These are just a few of the many cemeteries and graveyards you will see as you walk around downtown Charleston. They are all worth the time to meander through and experience the haunted side of the Holy City. So whether you’re in Charleston at Halloween or any other time of year, the spirits of the Holy City don’t take time off and are sure to give you a spook and a glimpse into our rich history. *Adapted from CHS Today, an excellent resource for things to see, do, and eat in Charleston.